“Steve Smallwood” “The Machine” – I Love It Spicy! 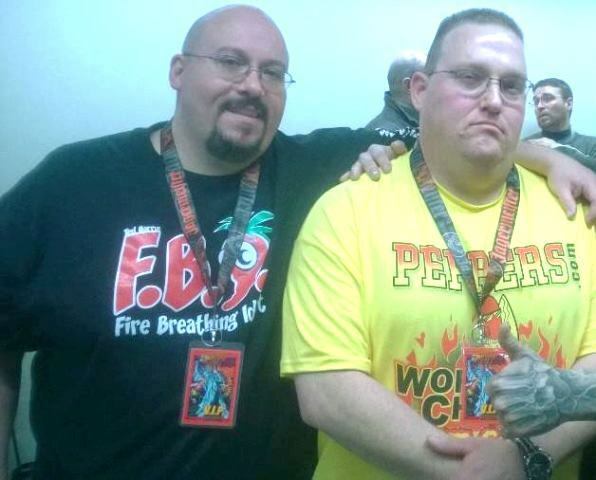 I got the honor to interview both Steve “The Machine” Smallwood & Ted the Fire Breathing Idiot a few hours before they were to attempt the Guinness Book of World Record for fastest eating time for the World’s Hottest Chile Pepper, Smokin’ Ed’s Carolina Reaper. I got a very honest take on their fears and trepidation on being on stage and taking on all that heat. We also discuss the NYC Hot Sauce Expo and some of their new favorites they discovered while there. LOTS AND LOTS of call-outs of companies between the 3 of us. You might be surprised how many milder hot sauces these guys recommend. Of course, I too chime in with a few of my own. It is a real fun interview, and I hope you enjoy it as much as we did in doing it. Enjoy!